On my way home, there had been a lot of law enforcers at the street. They came from LTO (Land Transportation Office) who were strict in implementing the laws and regulations among private and public vehicles. The jeepney, were I rode on my way home, did not escape from them. They stopped the jeepney and declared some violations. It delayed our trip for a while. I overheard that the violation incurred was overloading because the "konduktor" was already sitting on the middle of the jeepney and not on the passengers' seat. The violation would entail some fees and fines as well. I think the law enforcer was right in imposing the violation. They were only concern on the safety of the passengers. 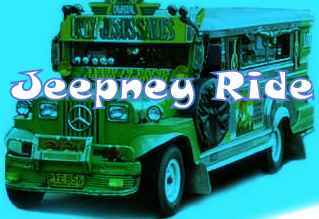 The safety of the passengers should always be the first priority of jeepney drivers. 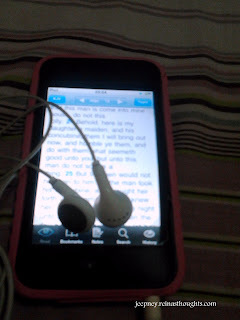 Thanks to my Ipod, I could be able to read my bible even if I was on my way to work or in going home while having my jeepney ride. When I was converted to a Christian, I promised to myself I would finish reading the bible before reading any novel or books. I was inspired to continue this because on one of my jeepney rides, my co-passenger brought with her a hard bound bible and kept on reading while inside the jeepney. Fortunate enough for me I have a soft copy of a bible in my ipod that anywhere may I go I would still be able to have my bible reading. I am still on the book of Samuel and there are still a lot of chapters and pages left. Hopefully I could finish this.